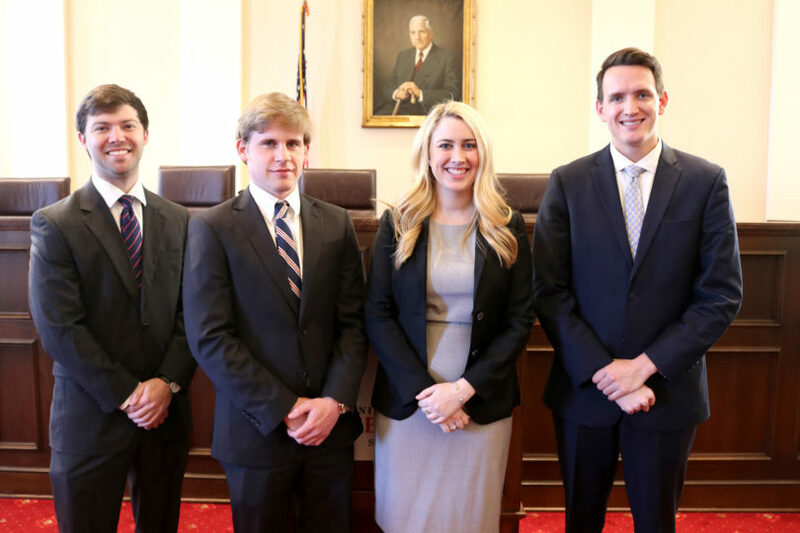 Athens, Ga. – The University of Georgia School of Law recently won the Sixth Annual South Texas Mock Trial Challenge, an invitation only national advocacy tournament. Third-year law students Jacob S. “Jake” Edwards and Christopher D. “Chris” Stokes argued the case, and second-year law students Oliver R. Ladd and Lauren E. Lutton served as witnesses. Third-year student Andrew Z.R. Smith served as student coach. In addition to being undefeated throughout the competition, the group was presented with the Outstanding Trial Brief Award, and Stokes was named the Most Professional Advocate. The last time Georgia Law won this tournament was in 2014. Consistently regarded as one of the nation’s top public law schools, Georgia Law was established in 1859. Its accomplished faculty includes authors of some of the country’s leading legal scholarship. The school offers three degrees-the Juris Doctor, the Master of Laws and the Master in the Study of Law-and is home to the Dean Rusk International Law Center. Georgia Law is proud of its long-standing commitment to providing first-rate legal training for future leaders who will serve state and nation in both the public and private sectors. For more information, see www.law.uga.edu.